Marshall County was notorious in Territorial Kansas for producing an election-day turnout that easily eclipsed the number of settlers actually living there, as if the few scattered cabins around Marysville functioned akin to circus-clown cars, suddenly disgorging hordes of voters who marked their ballots and then scattered on cue. Votes cast in Marshall County may have far outnumbered bona fide settlers, but there was a simple explanation. Since the Kansas-Nebraska Act had not imposed a minimum length of occupancy as a requirement for voting, proslavery Missourians teemed across the border, lined up at polling places, sometimes voting repeatedly under assumed names, then celebrated their shenanigans at the nearest grog shop before staggering homeward. Concern about fraud at the polls resulted in an annual count of eligible voters which often tells us a little something about a pioneer’s family life, or in the case of the 1858 tally, the month and year each one arrived in the territory. That's how we know that Louis Tremblé was the first settler along the Black Vermillion in 1854, and that Thomas Lovewell joined the fray in “Bleeding Kansas” in June of 1856, one month after a proslavery posse sacked the abolitionist stronghold at Lawrence. The 1858 canvass in Marshall County was compiled by Daniel C. Auld, a justice of the peace who famously refused to take the oath of office mandated by the Kansas Territorial Legislature, an oath which would have forced him to swear to uphold the Fugitive Slave Law. Auld convinced his friend James McClosky, who besides being a rough-hewn fur trader with a Sioux girl for a bride, was also clerk of the district court, to intervene on his behalf with District Judge Jeremiah Burrell. Burrell remembered a Pennsylvania oath which contained no offensive language upholding slavery, and used that to swear in Daniel Auld. Marshall County researcher Keith Jones suggests that Auld may have had a very solid reason for refusing to promise not to assist any fugitive slave who came his way: he is on a short list of suspects who may have been operating a branch of the Underground Railroad in Marshall County. Keith writes about a little-known Marshall County landmark, tucked away in a wooded ravine, rumored to have played a role in what was sometimes literally an underground network. My brother, Harry, wrote a history report about the cave when he was in High School in Frankfort in 1958 or 1959. He interviewed two people (Maud Jones & her uncle Fred Harvey) who told him about its legendary connection to the Underground Railroad. Their families had been here during the Territorial years. Several years before he was interviewed, Fred had lived in a small two story stone house near the cave and used the cave to store produce. He was probably the last person to go inside the cave. He said the cave was actually a long tunnel with a water-well at the back end of the tunnel. 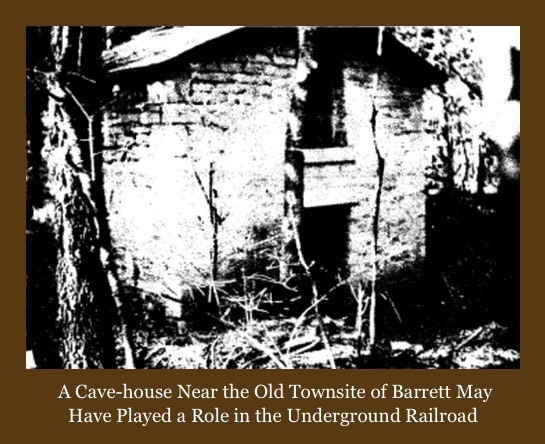 The roof was gone and the entrance to the cave (inside the house) had already collapsed by the time we moved from Barrett to the cave's location in 1950. Or at least it had already collapsed by the time I was aware of it when I was about 8 years old. I was only 4 years old when my dad moved our house from downtown Barrett to the site southeast of the cave. Several months back I passed along Dave Lovewell’s recent discovery that his great-grandfather Thomas was bidding on mail routes in Territorial Kansas. The one small contract he snagged required him to haul mail for a year between a budding settlement designated as Vermillion City, and the epicenter of another cluster of farms fourteen miles away which was called Nottingham. Neither place amounted to much beyond a cabin where mail was dropped off and picked up, Nottingham being the one on Daniel Auld’s farm, only the second post office established in Marshall County during the territorial period. While a Colton’s Atlas from that era pinpoints Nottingham as being 14 miles northwest of Vermillion City, Keith Jones, who lives in the region, assures me that it actually lay 14 miles to the northeast, as a careful reading of local historian Emma Forter’s book on Marshall County affirms. Thomas Lovewell would have made a trip up and down the valley of the Black Vermillion, past A. G. Barrett’s farm on the way to Nottingham on horseback or by wagon every Saturday. If there really were a safe house for runaway slaves in the neighborhood, one has to wonder if Thomas ever escorted any deliveries besides the U. S. mail.